Mr Winston has been providing this technology to his adult patients with spectacular results. As an adult with misaligned teeth you can feel you’re the only one without a perfect smile, but a recent study revealed that 75% of people don’t feel confident smiling in a photograph. The main concern people have are crooked, overlapping, or gappy front teeth, but there is no longer any need to be embarrassed by your smile because a revolutionary orthodontic treatment is available to straighten them. Six Month Smiles is a common sense orthodontic treatment designed specifically for adults to be as indiscreet and practical as possible for people who decide to fix their uneven smiles. Adults are known to avoid orthodontic treatment because of their worries about how expensive, invasive and lengthy the process will be. However, Six Month Smiles braces are tooth coloured, which means they are significantly more discreet than their predecessors. What is more, these revolutionary braces only have to be on for 6 months, in comparison to the years it used to take to achieve perfect teeth. At Mossley we have over 25 years of experience ensuring that all our patients leave with a smile to be proud of. To those born with flawless pearly whites teeth won’t matter, but we understand how much impact having beautiful straight teeth can make on someone’s life. You are in good hands at Mossley dental, as we are registered with the Quality Commission and have recently been accredited with the British Dentistry Association’s ‘Good Practice Scheme’. Orthodontic treatments continually improve and we are passionate about offering as many modern techniques to ensure your teeth can be straightened with the least impact possible. The idea of braces as an adult may feel daunting, which is why we offer the Six Month Smile Treatment to give you the least invasive and most affordable method of obtaining your perfect smile. 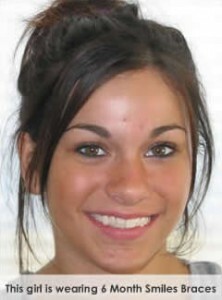 To enhance this smile further, we provide free home tooth whitening to all our orthodontic patients. 45% of the public think people make judgements by the look of their smile and it is our aim to provide cutting edge orthodontic treatments, so that everyone can achieve the confidence that comes with a great smile. For a free initial consultation with Mr Winston please call our Reception team on 01457 837361 to arrange your appointment. Is Mr Winston an orthodontist? Mr Winston is a dentist with a special interest in orthodontics. This means that after his dental degree he has undertaken a postgraduate degree in orthodontics (a masters of science degree). 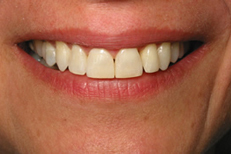 This involves further education in teeth straightening techniques where he completed and presented multiple cases which were assessed by a panel of specialists to have been a satisfactory standard. Six Month Smiles is also known as six month braces and is basically an orthodontic treatment option for adult patients who are interested in teeth straightening. These types of braces are tooth coloured which means they blend in and are far less noticeable than “old style” metal train track braces. We use composite or ceramic brackets along with tooth coloured coated wires and as the name suggests Six Month Smiles usually takes about six months! 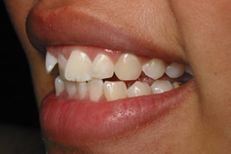 Six Month Smiles is an orthodontic appliance which is fixed onto your teeth which means that you cannot remove them. For some patients this suits them very well because they don’t need to worry about taking it in and out of their mouths but other people may prefer removable appliances which can be removed for eating and cleaning. If you attend Mossley Dental Care for an orthodontic consultation, we can discuss whether Six Month Smiles invisible braces are suitable for you and also explain your other options. For our Six Month Smiles or six month braces cases we use state of the art Nitinol alloy arch wires which possess great properties for tooth straightening. Nitinol has shape memory and super elastic properties which means that when it is placed in the mouth and warms us to body temperatures it delivers a consistent ideal force to move the teeth over a long period of time keeping the forces very gentle and moving the teeth more effectively so they don’t need to be “tightened” as often. 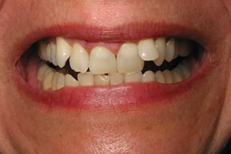 These Six Month Smiles clear braces usually allow us to treat patients without taking teeth out, which we always prefer, however there are still a few selected situations where we will need to take teeth out but only if absolutely necessary. If you have crooked teeth Six Month Smiles may be suitable for you and we are happy to offer a free orthodontic consultation where we can discuss what would be best for you. The cost of braces varies from cases to case depending on the severity of the problem, how long the treatment will take, whether we treat only one arch or both your upper and lower teeth, and the only way we can give you an accurate quote would be to see you in person for a free no obligation consultation. However, prices start from as low as about £50 per month and we offer flexible payment plans including 0% finance over 12 months. We are confident that we offer great value for money at Mossley Dental Care. We are outside the city centre so our overheads may be lower than some city practices, allowing us to offer very competitive prices. However, rather than talk about only our prices we would like to stress that Mr Winston takes great pride in his work and treats all his patients to a very high standard. If you decide to trust us with your orthodontic treatment, then you will be treated in the comfort of our state of the art practice by our experienced clinicians. We treat everyone how we would want to be treated ourselves which is why we have a great reputation around Greater Manchester for excellence in orthodontics. Every case is different and so the cost of braces varies from person to person. Prices start from about £50 per month and we offer flexible payment plans which can help you spread the cost over up to five years if you want. To ensure that the cost of your braces is money well spent we include free retainers with your orthodontic treatment which ensures your teeth will stay straight and also free home tooth whitening for adult patients. 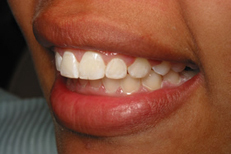 We charge a clear and transparent one off fee for orthodontic treatment with no hidden charges. Do the Six Month Smiles braces hurt? Six Month Smiles orthodontic braces are quite comfortable but it takes a few days to get used to them. When we fit your appliances we will take time with you to describe what it is going to be like. Most people find that their teeth are a bit sore for at least a few days but are certainly not in severe pain with them. You may need to eat a soft diet for a few days until you adapt to having them in your mouth, but almost all patients say that after two weeks they are used to them and treatment from then on tends to be practically pain free. We understand that everybody has a different pain threshold so it would be wrong to say braces are 100% pain free, but the discomfort is usually mild and only lasts a few days.